Burj AL-Luqluq Social Center Society girls’ basketball team came back from Wiesbaden after going for a cultural trip with the presence of the Director of Youth and Sport Department in Wiesbaden, Philipp Hanusch, Burj AL-Luqluq Executive Manager, Muntaser Edkaidek in addition to the Palestinian Dr. Kamal Hamzeh Edkaidek w lives in Wiesbaden, as he insisted to accompany the Palestinian group to support them. 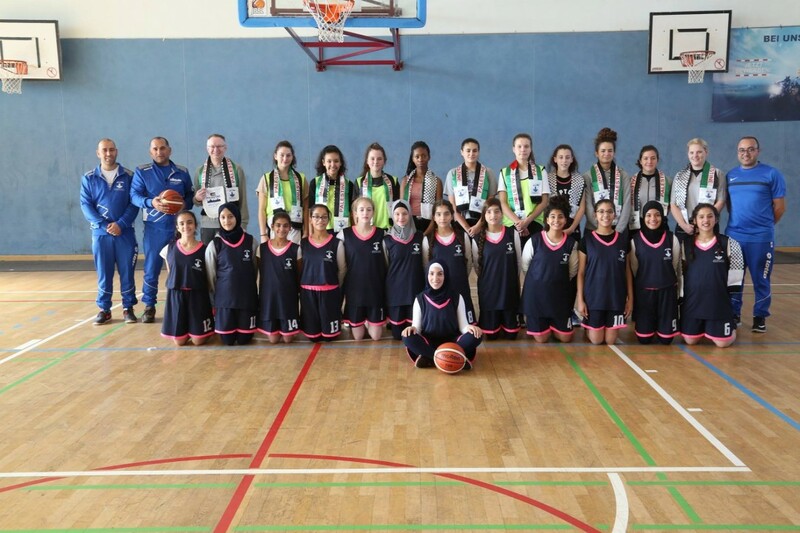 Our girls distributed Palestinian Kuffiya’s to the German girls, more over the trainer Ahmad Jaber gifted them a memoir from Burj Al-Luqluq while they gifted our team a basketball. As requested by the girls, two mixed teams were formed to play a friendly game aiming to leave good memories among all. After the friendly match both groups went to have lunch in the city as where Philipp Hanusch thanked Burj Al-Luqluq for their special cooperation assuring that Burj has always had a good relationship with the Youth Department at Wiesbaden Government. The head of Burj Board, Nasser Gaith, thanked Philipp Hanusch and the youth department for their nice welcome and great cooperation.